Pope Francis reportedly to put wreath on grave to correct 110-year-old historic injustice by Vatican; PMO denies David's Tomb transfer. Pope Francis will arrive in Israel next Sunday, where he intends to make a symbolic gesture apologizing for an historic injustice made by the Vatican 110 years ago. In 1904, Zionist leader Theodor Herzl visited the Vatican to ask Pope Pius the Tenth to help establish a modern Jewish state in Israel, the historic homeland of the Jewish nation. Pius rejected the request. Now, Pope Francis plans to visit Herzl's tomb on Mount Herzl in Jerusalem to place a wreath on the grave, in a sign of apology and a request for forgiveness, reports Israel Hayom. The pope's visit is surrounded by controversy from its very beginning, being as it starts with a stop in Palestinian Authority (PA) controlled Bethlehem, in a move hailed by Arab sources as "recognizing Palestine" and helping to "end the occupation." 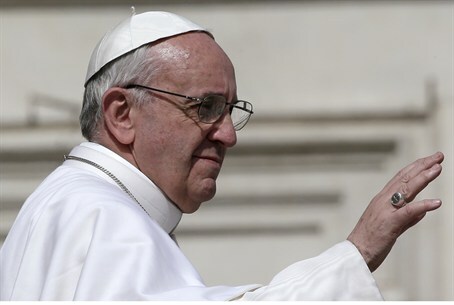 Reports surfaced in February by Rabbi Sergio Bergman, a member of the Argentinian parliament and close friend of Pope Francis, that the pope intends to define himself as the "Che Guevera of the Palestinians" and support their "struggle and rights" during his visit. Another point of contention revolves around reports that Israel intends to relinquish control over parts of the David's Tomb Compound in Jerusalem to the Vatican during the visit. Many officials, including the internal security minister, have denied the reports. Joining those denials was the Prime Minister's Office and Foreign Ministry, which announced on Tuesday "there is no change and no expected change in the status quo, and there's no transfer of rights on prayer rooms from one religion to another." The denial also comes in response to recently reported plans to dramatically increase the number of days on which Christian services are held at the compound, which holds the "Last Supper Hall," from one day per year to 60. Despite the government promises, a Catholic official told the Salt Lake Tribune on Tuesday that the Vatican wants "to hold two hours of [Christian] prayer every day in the early morning before visitors start to visit it," which would certainly change the status quo. Rabbi Yisrael Ariel, head of the Temple Institute, told Arutz Sheva that an increase in Christian prayers would compromise the halakhic (Jewish legal) status of the Compound and prevent Jews from being able to pray at King David's Tomb, by potentially giving it the effective status of a church. The rabbi added that security sources have tried to silence him on the subject during the pope's visit. Regarding the pope's arrival in Jerusalem, Mayor Nir Barkat said "the pope's visit will reveal the capital of Israel as a modern city open to the whole world." Jerusalem Councilman Aryeh King announced he would not attend an official welcoming of the pope unless he "will bring in his suitcase the treasures of the Jewish people that were stolen by his predecessors, treasures that today are located in the Vatican's basement."